Quantum Healing Hypnosis Academy offers fully accredited classes for Dolores Cannon’s hypnosis technique, QHHT®. Upon completing the Level One Class and passing a multiple choice exam you will receive a Level One Intern certificate when you have submitted notes for your first 10 sessions that you will perform at no cost or by “free-will” offering. After you have received your Intern certification, you will continue to provide sessions at no cost or by “free-will” offering until you have an additional 15 Sessions (all on different people). You will need to send in the notes from these 15 sessions to receive your Level One Practitioner certificate. You will then be listed as a Level One Practitioner on our two websites and can start charging for your sessions according to your geographical area and experience. Level 2: For QHHT® practitioners who have attended Level 1 and have practiced with a minimum of 25 different people, this supplemental course will focus on strengthening core QHHT® skills. We will work with the practitioners on your interviewing and questioning skills and then spend one-on-one time working specifically on your ‘voice’ skills. Note that while 25 (twenty-five) sessions is the absolute minimum requirement, we highly recommend that the practitioner conduct more than 30 sessions in order to take the most advantage from this class. Level 3: The Level 3 class is for practitioners who have completed Level 2 (since January 2014), have been in practice for one year, have a minimum of 125 sessions, and facilitate QHHT® as Dolores taught. This 3 day small group course offers professional assessment and feedback on the practitioners’ actual session recording including but not limited to: the interview process, the session location, induction, lifetime/s, contact with the SC and more. Videos will be reviewed in a group setting so each practitioner will not only learn from their own video, but from the others’ videos as well. The Level 2 & Level 3 classes are ‘live’ classes only, and not offered online due to the intensive interaction provided. *Price may vary when course is held outside of the USA. A non-refundable/non-transferable $200 deposit will be held at time of reservation. The Level 1 course is a 6-day workshop which will equip you with the knowledge, skills, resources and confidence to practice QHHT®. 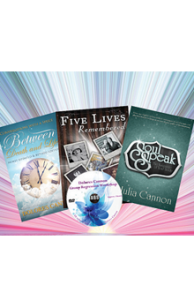 The course will begin with an introduction to QHHT® and an overview of Past Life Regression and The Subconscious. You will then learn, in great detail, every aspect of Dolores’ QHHT® technique taught by Julia with interactive video of Dolores. You will be guided through the entire process of meeting a client, the necessary pre-session actions you must take, the actual session itself and necessary post-session actions. You will witness Dolores performing a session with a student. The course will end with one day of practice where you will be able to perform your newly learned skills on other students and the final day to discuss your results and experiences and receive immediate feedback from Julia and other very experienced Practitioners. * You must be 18 years of age or older to take this class. Review of the previous day’s events with immediate feedback from Julia and other very experienced Practitioners. Level 1 Course Summary: What you will learn? How to perform Dolores’ Quantum Healing Hypnosis Technique℠ in its entirety so you can practice and achieve the same healing results, immediately. QHHT® Practitioner Handbook: Comprehensive instructions and guidance for each stage of Dolores’ Quantum Healing Hypnosis Technique℠ and a step-by-step description of the entire process from beginning to end. USB Stick: Contains a complete recording of a previous Level 1 Course so you can re-listen to any parts of the course you are attending that you may want to go over again. Also contains recordings of sessions Dolores has conducted with former clients. After completing the QHHT® Level One course you will have all the tools necessary to practice QHHT®. Please note cell phone usage is not allowed during class so you will give your full attention to the material. *Upon completing the Level One Class and passing a multiple choice exam you will receive a Level One Intern certificate when you have submitted notes for your first 10 sessions that you will perform at no cost or by “free-will” offering. The QHHT® Level 1 Online Companion Program is for online graduates and anyone wanting to brush up on their skills. The live 3 day class is given by an experienced and approved Quantum Healing Hypnosis Academy practitioner facilitator. This class provides a day to answer your questions, a day to practice your new found skills with other classmates and a day to share your session results and receive immediate feedback. This program is perfect for new online course students, practitioners who have previously completed the online course, or any practitioner who would like to get some practice sessions in, ask questions about their sessions and connect with other practitioners. The price of this program is $340. A $100 non-refundable/non-transferable deposit will be required for current QHHT® Practitioners at the time of registration. The remaining program balance will be due by the beginning of the first day of the live course. Payment options are available, please contact info@qhhtofficial.com. These companion classes will be offered at various times throughout the world. Visit our Upcoming Courses Page for locations and dates. If you are interested in having one of these classes in your area please email info@qhhtofficial.com. If we have enough demand in your area we will do our best to schedule a companion class. *You must be 18 years of age or older to take this class. *Note: New practitioners who have successfully completed their Level 1 training and provided documentation of 10 practice sessions, may now be listed as a Level 1 Intern. Until these Interns have taken their QHHT® Level 2 Class or completed 25 sessions, they may continue to facilitate sessions to gain experience at no cost or by “free-will” offering. *Price may vary when course is held outside of the USA. A non-refundable/non-transferable $100 deposit will be held at time of reservation. In order to attend a Level 2 course, you must have previously attended a Level 1 course and you must have completed at least 25 sessions on different people using this technique. 25 (twenty-five) sessions is the absolute minimum requirement, however more than 30 sessions are highly recommended in order to take the most advantage from the class. After some real life experience you may wish to broaden and deepen your skills and for this reason we offer the Level 2 class. This advanced class provides a unique opportunity to “fine tune” several key areas of your QHHT® practice and will increase your confidence in dealing with some of the more unique sessions you might encounter. Julia and several of our most experienced Practitioners not only work with the class as a group but also individually with one-on-one guidance. This 4-day class focuses on reviewing several crucial aspects of your QHHT® practice including your hypnotic voice, your interview and counseling approach and the ever important skill of asking questions during the actual regression. There is considerable time spent on mock sessions, demonstrations, voice instruction and extensive question and answer sessions are offered in a lively and supportive atmosphere with practical and constructive feedback. Level 2 is an interactive classroom experience. Your participation in class; working one on one to hone your voice, seeing improvements on your interview style and the way you ask questions in a session is expected. The group energy of these classes is amazing and the Practitioners who often trade sessions after class report some incredible experiences. For the experienced Practitioner looking for a deeper immersion into the wonders of QHHT® and spending time with others just like you, this may be a class worth considering. The cost includes 4 full days of interaction and instruction and 4 lunches. Each of these days will incorporate in depth interaction on specific areas that can sometimes be challenging, such as: interviewing technique, the voice, the art of questioning, the left brain client, and more. We will also share more case studies from Dolores and other practitioners’ sessions to show the ever expanding capability of this technique. Please note cell phone usage during class is not allowed so that you will give your full attention to the material. The Level 3 class is for practitioners who have completed Level 2 (since January 2014), have been in practice for one year, have a minimum of 125 sessions, and facilitate QHHT® as Dolores taught. This 3 day small group course offers professional assessment and feedback on the practitioners’ actual session recording including but not limited to: the interview process, the session location, induction, lifetime/s, contact with the SC and more. Videos will be reviewed in a group setting so each practitioner will not only learn from their own video, but from the others’ videos as well. Practitioners do not receive a certificate for this course for simply attending class, most often there is follow up work to be done outside of the classroom setting. Level 3 is a finite evaluation of your QHHT® skills. This advanced class is designed for those practitioners that do QHHT® professionally and want their skill level to be very pure to how Dolores Cannon did her sessions. There are serious criteria to meet and to maintain for this designation. Unlike Level 1 and Level 2 classes, the process to attain the Level 3 status begins with the class and continues until the practitioner is passed by Julia Cannon. This can involve more than one video submission, extended refinement on the voice and session questions. The average length of time to pass the Level 3 class is 6-9 months. One page session notes for each session. Course requirements should be sent to the QHHT® office to info@dolorescannon.com. Once this course is completed along with any follow up work, practitioners will be certified as a Level 3 Quantum Healing Hypnosis Practitioner. Actively assisting new practitioners (either via the QHHT® Official Forum or provide 3 reference letters from practitioners. Anyone with outstanding complaints must retake the Level 3 course. In all classes it is mandatory that cell phones are turned off so that attention is on the class material.